March 20th marks the first day of spring. With it comes tidings of new life, warmer weather, longer days and last but not least, National Clean Out Your Medicine Cabinet Day! Check the dates. Examine everything in your medicine cabinet, including ointments, supplements and vitamins. Discard any item that is beyond the expiration date. Many medications lose their effectiveness after the expiration date. 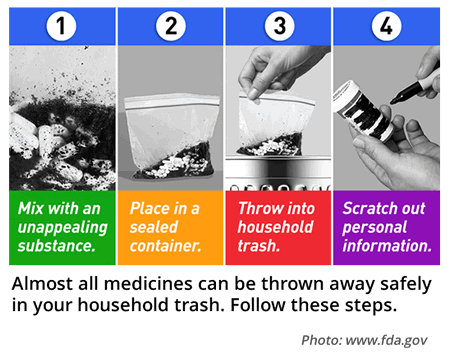 Discard any prescription medications if they more than a year old. Discard any items that have changed color, smell or taste. This includes any colors that have faded, because they may have been exposed to too much light. Store medications up out of the reach of small children and store in an area that doesn't allow sunlight. The bathroom isn't always the best place to store medication. The temperature and humidity changes that take place while the shower is running can lower the potency of your medication Consider a drawer in your dresser or a lock box in your closet. Crush or pour pills and capsules in a sealable bag. If there are solid medications, add some water so they can dissolve. Fill the sealable bag with unappetizing or unappealing materials that will soak up any liquids such as; kitty litter, coffee grounds, saw dust, or any material that mixes well and makes it unappealing for children or animals to eat. Remove any identifying information on the prescription bottle (like the label with privacy information), clean and recycle. For additional information call the City of Columbia Solid Waste Program.